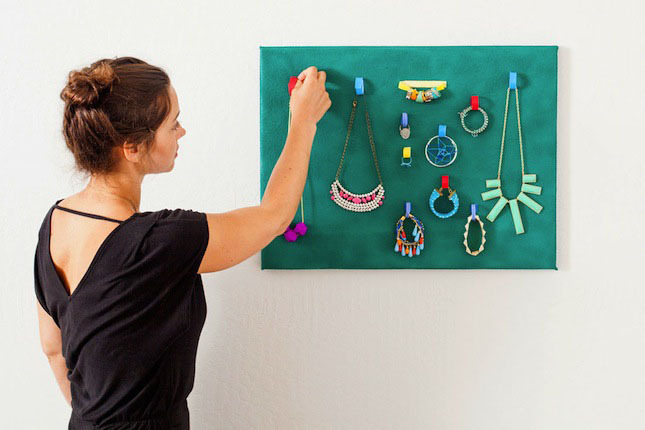 We’re always on the hunt for clever ways to organize and display jewelry and we came up with this project to help you create a colorful and convenient wall display. The fun thing about this is that it looks good enough to double as wall art in your bathroom or bedroom, and is versatile enough to fit whatever jewelry or accessories you need to organize. 1. Create a sheet of VELCRO® Brand Attach-a-Patch® sheets to 28 inches x 22 inches. 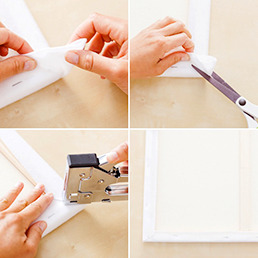 If you’re using a different size canvas, you want to size the sheet so that there are 2 extra inches on each side. You can also use white felt for this, but heavy jewelry may not hold. 2. 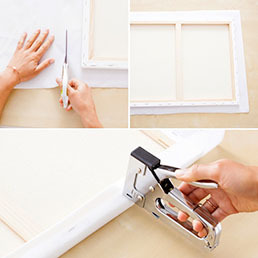 Use a staple gun to attach the VELCRO® Brand White Sheet to your canvas. 3. 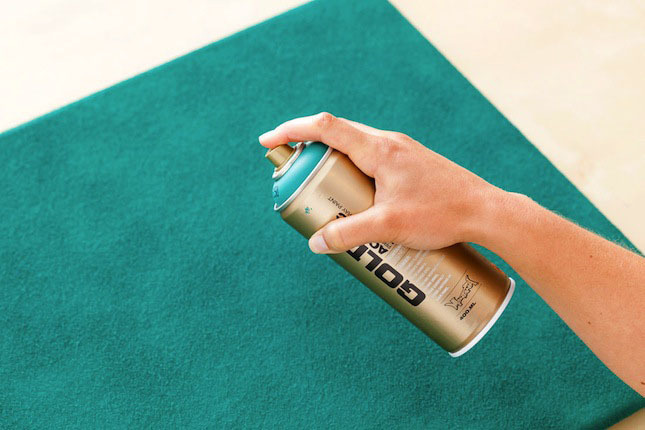 Spray paint the whole thing in a color that suits your space. 4. 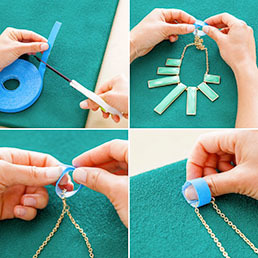 Cut pieces of VELCRO® Brand Tape and loop them to organize necklaces. You can also use VELCRO® Brand One Wrap Straps. 5. 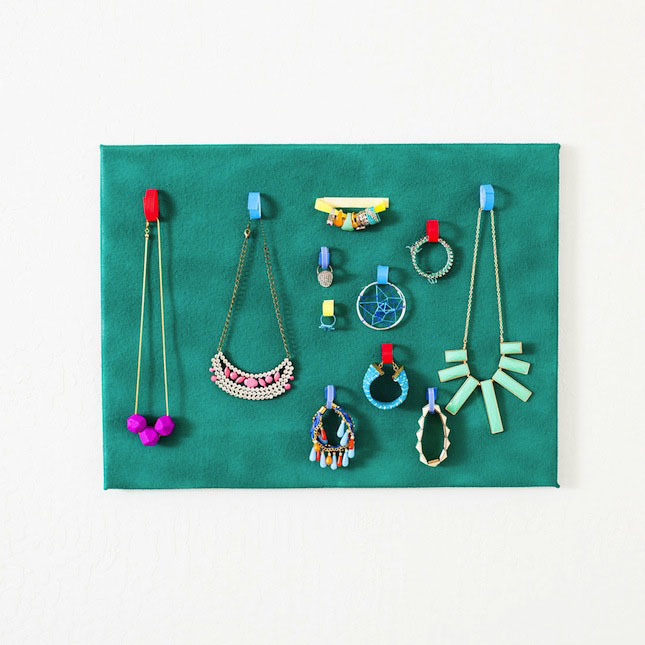 Hang on the wall, and keep those jewels organized! 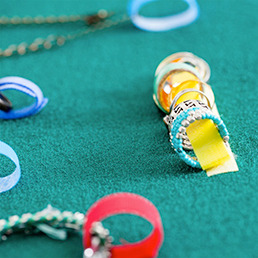 As you can see, we used a whole bunch of colors of VELCRO® Brand Tape and VELCRO® Brand One Wrap Straps. 1. Create a sheet of VELCRO® Brand Attach-a-Patch® sheets to 28 inches x 22 inches. 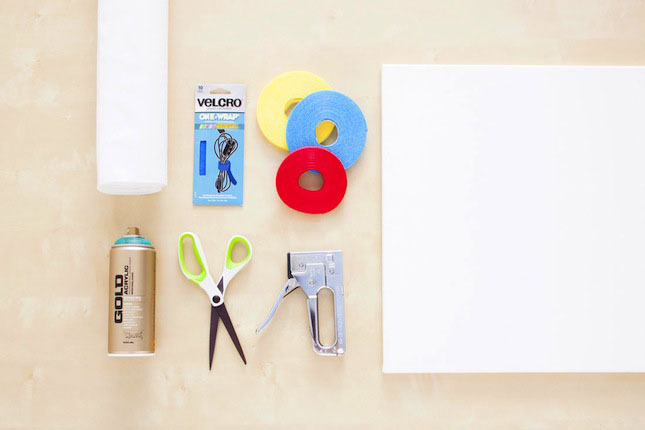 If you’re using a different size canvas, you want to size the sheet so that there are 2 extra inches on each side. You can also use white felt for this, but heavy jewelry may not hold. The corners can be a little tricky, so you may need to cut off additional material before stapling it. We painted our VELCRO®-covered canvas a dark teal. Now, time to get organized. Almost done! That’s it! Congratulations on your custom jewelry and accessory organizer!